Carl Weber is one of my favorite book authors' so when I heard about his book 'The Man In 3B' being made into a movie, I was a little nervous because like some books that have become movies didn't serve no justice. With this film ALL JUSTICE was served, I absolutely loved this movie I just can't get enough. 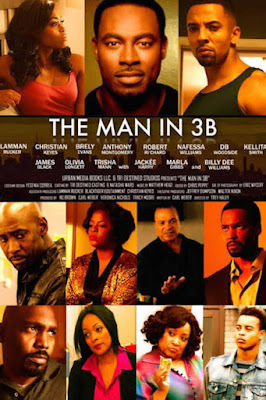 Released in 2015, Directed by Trey Haley Starring an All-Star cast Lamman Rucker, Christian Keyes, Brely Evans, Anthony Montgomery, Robert Ri'chard, Nefessa Williams, DB Woodside, Kellita Smith, James Black, Olivia Longett, Trisha Mann, Jackée Harry, Marla Gibbs, Billy Dee Williams. You will enjoy this production to the fullest. I promise. Daryl Graham has just moved into an apartment in Jamaica, Queens and his neighbors cannot stop talking about him. Daryl is the man every woman wants and every man wants to be. Unhappy wife Connie turns to Daryl to lose weight and fix her marriage. But when Connie starts to feel beautiful again, she questions whether her marriage is worth saving. Spoiled teen Benny looks up to Daryl. When an unexpected event occurs, Benny questions everything he has understood to be true. Daryl's first love, Krystal, wants her current relationship to work. With Daryl back in her life, things with her new boyfriend start to spin out of control. And Avery, Connie's husband, is only really concerned with financial gains, that is, until he notices how preoccupied his wife is with the new neighbor. All in all, everything seems to be going well, but when a murder happens, everyone becomes a prime suspect.